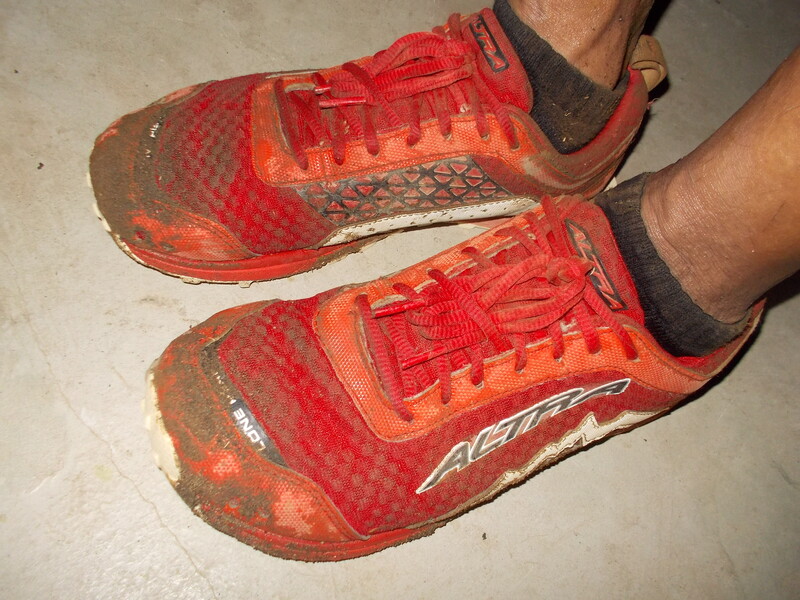 You always hear the usual greetings, “ Welcome to the Dark World of Ultra Running”, when you finish an ultra race. The way I understand the greetings or statement is that an ultra runner needs to run and finish the race at all cost with his/her strength within the prescribed cut-off time which can last till night time or till the next day. It also means that an ultra runner should also come into reality that running in darkness is part and parcel of being an ultra runner. 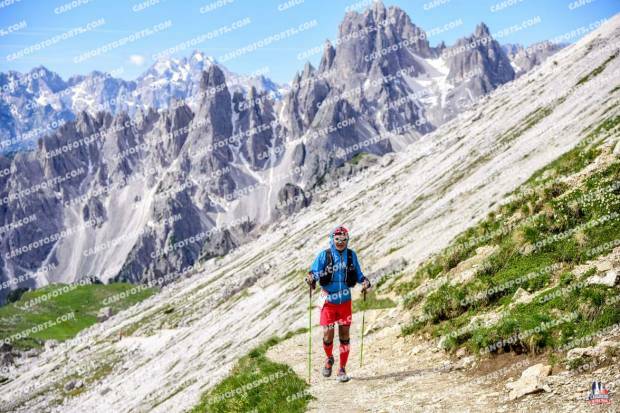 As I progressed from 50K distance to 100+kilometer distance races and in my personal experiences in my multi-day adventure runs, I learned to appreciate running at nighttime or in darkness. It came to a point that I have to train and run more kilometers in my training during nighttime. Slowly, I am starting to appreciate the meaning of the said greetings. 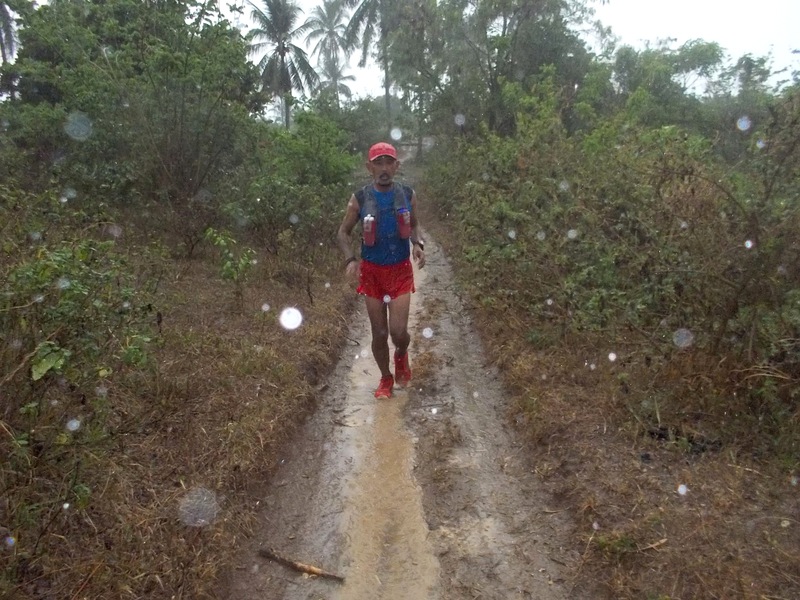 In the ultra races that I organize and direct, most especially on the 100-miler distances, like the BDM 160 and TD100, I observed that runners have the fear of darkness, moreso, when they have almost completed one half of the course. This is where I received information of runners of declaring themselves as DNF in the race. Despite the completeness of lighting equipment of the runners, the fear of running in the darkness comes into their minds. What could be the reason why runners have the tendency to quit the race when darkness comes? If you ask me, I really don’t know why! Some runners are afraid of dogs on the streets and trails during nighttime and I could understand their predicament. But based from stories from ultra runners, running in darkness alone saps the strength and mental fortitude of an ultra runner. Could it be that this observaton is only applicable to Pinoy ultra runners? I personally don’t believe so. 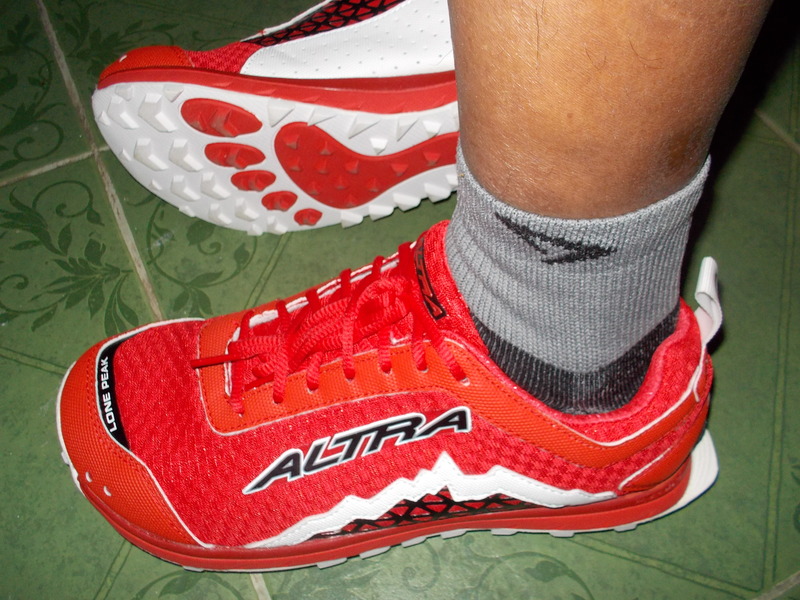 I firmly believe that Pinoy ultra runners are brave to run in darkness. 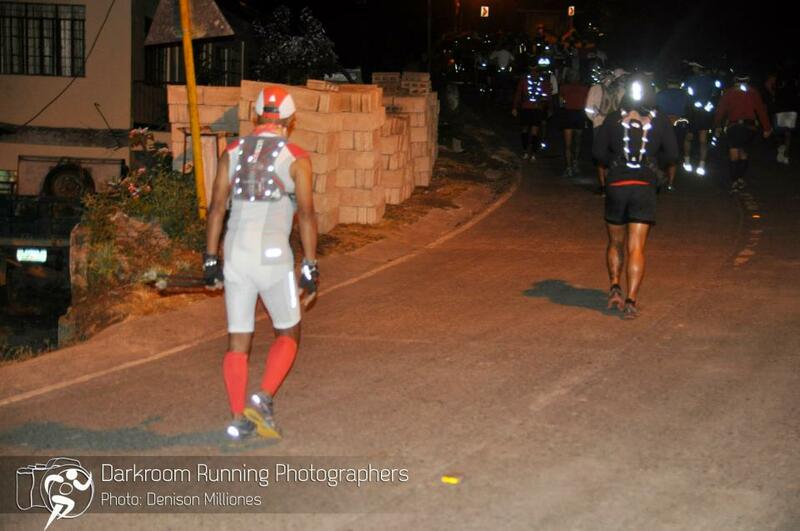 So, how do we deal with the fear of darkness in ultra running? In my experience as past military commander, darkness is always a friend of the troops. Soldiers move silently under the cover of darkness in order to “surprise” the enemy and ultimately, defeating them. Some runners also adopt such stealth tactics in ultra races when they put-off their headlights to “surprise” their targets as they get nearer and pass them. Always think that darkness is your constant ally during the run. Don’t believe on ghosts or vampires roaming around you waiting to strike you. There are no such things or creatures! If somebody appears in darkness and it is moving, most likely, it is a human being like you or an animal roaming around the place. In this age of high technology, there are lighting equipment, i.e. 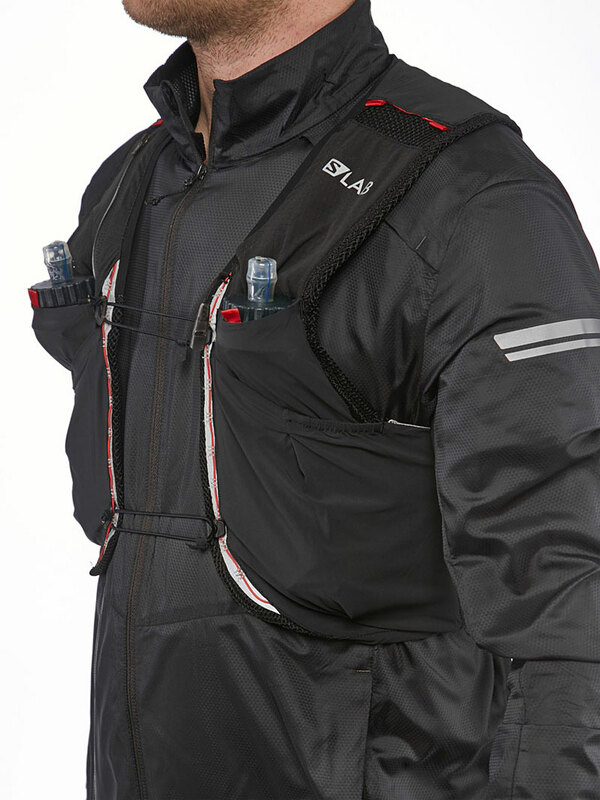 headlamps and hand-held flashlights which have high and powerful illumination with lesser use of power/batteries. There are also batteries which can give extended period of constancy for the illumination needed for these headlamps. Get these “high-tech” headlamps and flashlights and use them in your night runs. It is advisable to use them during your training runs in order to find out for yourself if the advertised capabilities of these equipment are true or not. Never use “new” lighting equipment on race day. And bring extra batteries for your headlamps and flashlights. For better illumination on the course, use both your headlamp and hand-held flashlight. The headlamp is focused on the road/trail (where the feet are leading to) and the hand-held flashlight is directed on a wider-angle in front of you covering both sides of the road/trail. Most of the time, fear of darkness is attributed or caused by human beings or animals you meet on the course of your run. In my experience, I usually wave my hand and start a conversation by greeting the individual with the usual “Good Evening” or saying, “We are in a middle of a “Fun Run” or “I am jogging to this place and I started from this place”. Always start the conversation and try to look them on their faces. But most of all, simply smile at them and show on your face that you are having fun and enjoying the run. As for stray dogs, simply walk and observe the movement of the dogs. Directing the light of your flashlight to the face of the barking dogs could also “stun” them temporarily. 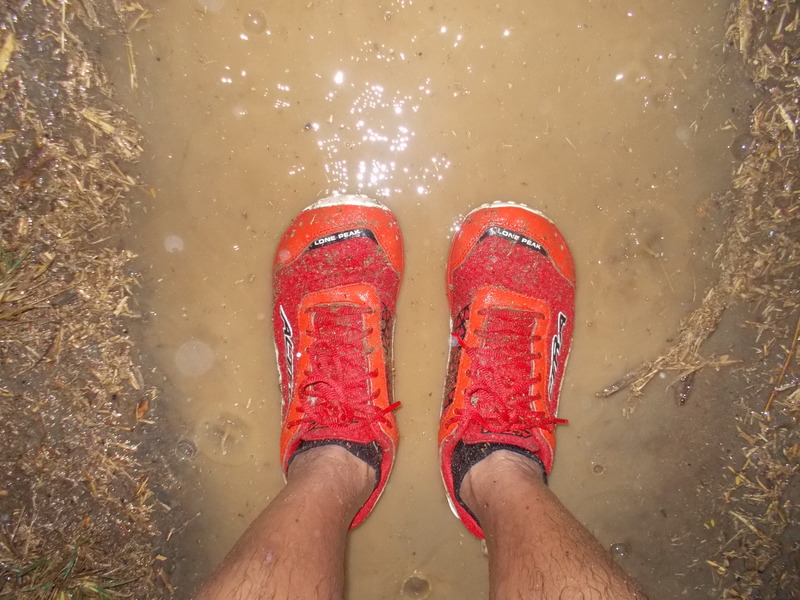 Gaining 100% confidence running in darkness is through running the course on nighttime. If the course is not available or accessible, you can find a place that resembles the elevation or terrain of the course. Try running alone on this course using your headlamp and/or flashlight not once but as many as you can. Repetition of such workout during nighttime conditions the mind to be relaxed and focused. Sometimes, having a “buddy” who trains with you could also give confidence and solve your problem of the fear of darkness. Get somebody who would be your pacer or somebody who have the same pace and strength as with you. But you must be always prepared for the “worst” scenario if your “buddy” declares himself as DNF. Get somebody as your “reserve” pacer or “buddy” or wait for another runner to pass you and stick with the said runner as you continue your run. Make that runner as your “point man” along the course. If you are preparing for a 100K or 100-mile trail ultra marathon, running at nighttime should be your friend and ally. I have never run for any political advocacy and for the five years that I have been blogging and running, I have maintained the simplicity of my purpose. I simply wanted to inspire others to run; challenge their physical and mental limits; and promote adherence to a healthy lifestyle. In a spur of the moment decision, I think I did something for the good of everybody in the name of PEACE & UNITY. 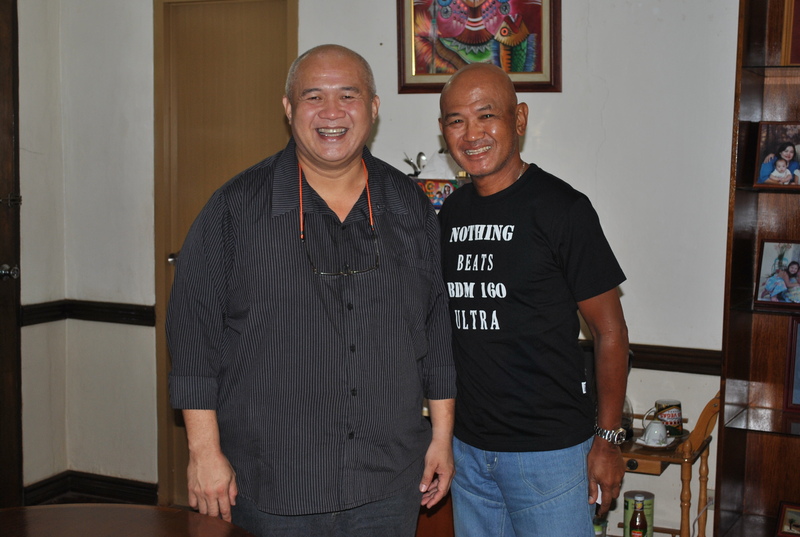 After I have conducted my final coordination with the Governor of Guimaras, the Honorable Felipe Hilan Nava, in the conduct of the 1st PAU National Championship 110/50, I have decided to have a side trip to Bacolod City. With a telephone conversation with the Philippine Army Brigade Commander who is responsible for the province of Negros Occidental and telling him of my plan to visit his place, my side trip was set even if the lead time is only 12 hours. 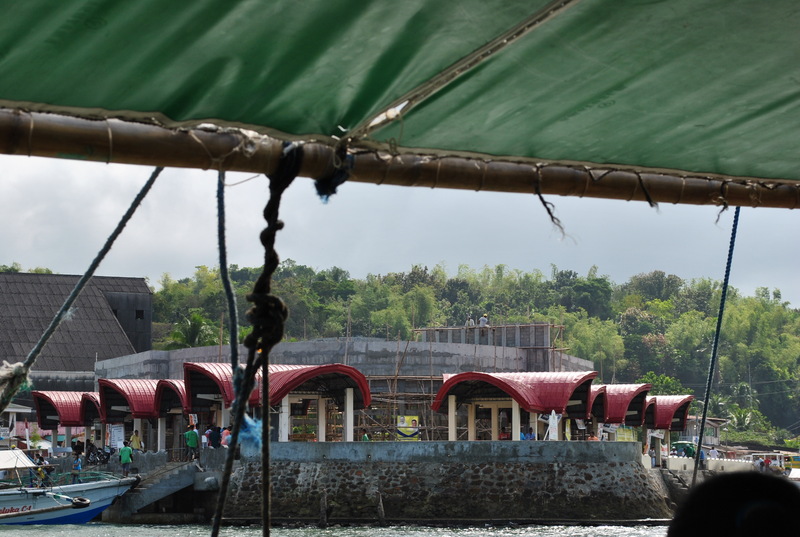 The Super Ferry Boat plying Iloilo City and Bacolod City is a very convenient and cheap way to travel as one would take only 2 hours. The fare is P 620.00, one way, but I was able to get a 20% discount for being a Senior Citizen. 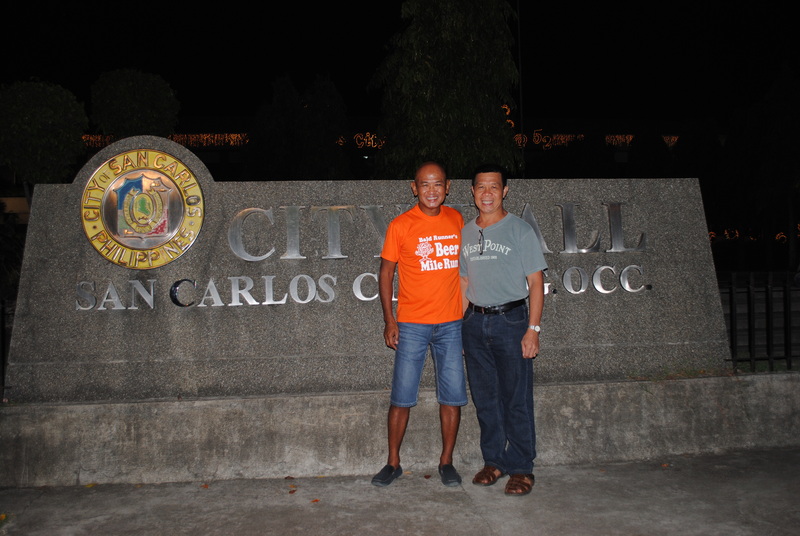 At the Bacolod City Port, I was met by a Driver (MSgt Arnel), a Security Aide (Sgt Julius), and a Van. I was brought immediately to the Headquarters of the Philippine Army’s Infantry Brigade in Barangay Minoyan, Murcia, Negros Occidental, a distance of about 25 kilometers southeast of Bacolod City. The Commander and the Deputy Commander, who happened to have served under me when they were Captains, are now Colonels and about to be promoted to the One-Star General rank. They were waiting at the Commander’s Quarters where breakfast was prepared and served. Both of my hosts are runners and sports enthusiasts. The Commander, Colonel Oscar Lactao, is the “Top Gun” of his Class in the Philippine Army, had scaled and peaked Mt Canlaon few weeks ago. 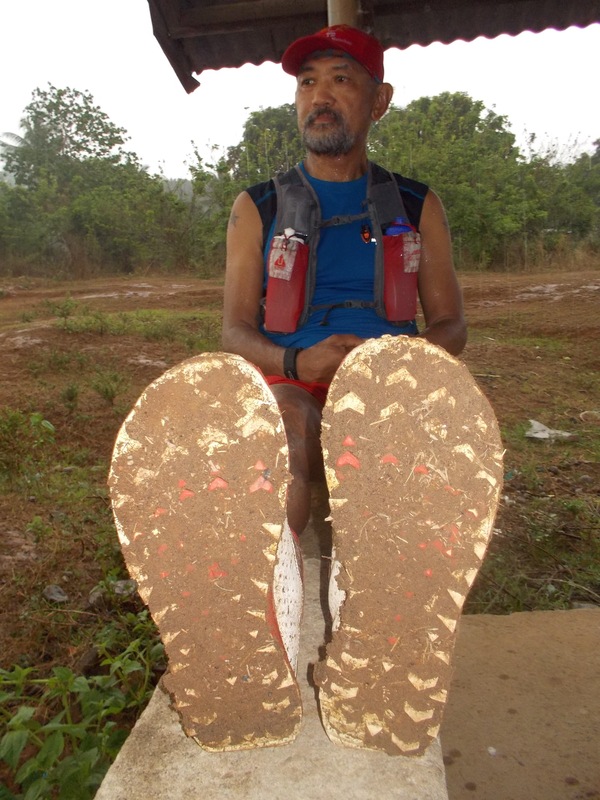 The Deputy Commander, Colonel John Aying, had been a sprint runner and turned into a long distance runner because of my influence to him as he served directly under me for 5 years. 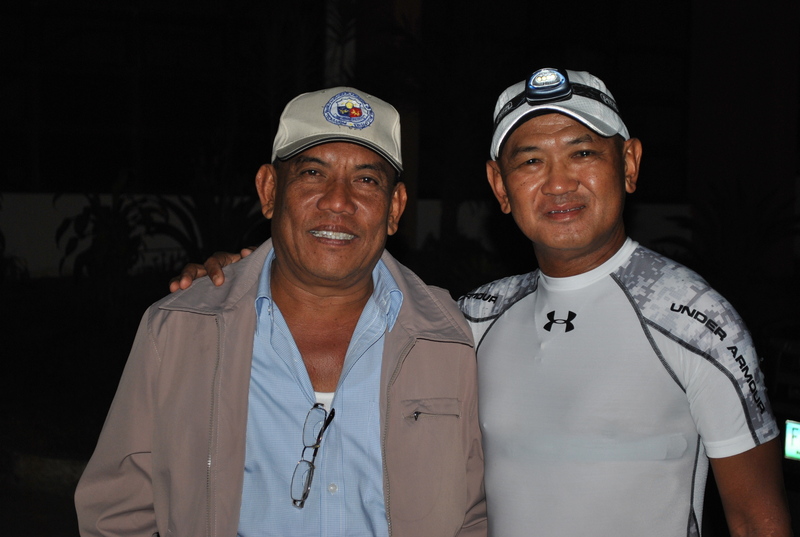 These two Colonels are classmates in the Philippine Military Academy. 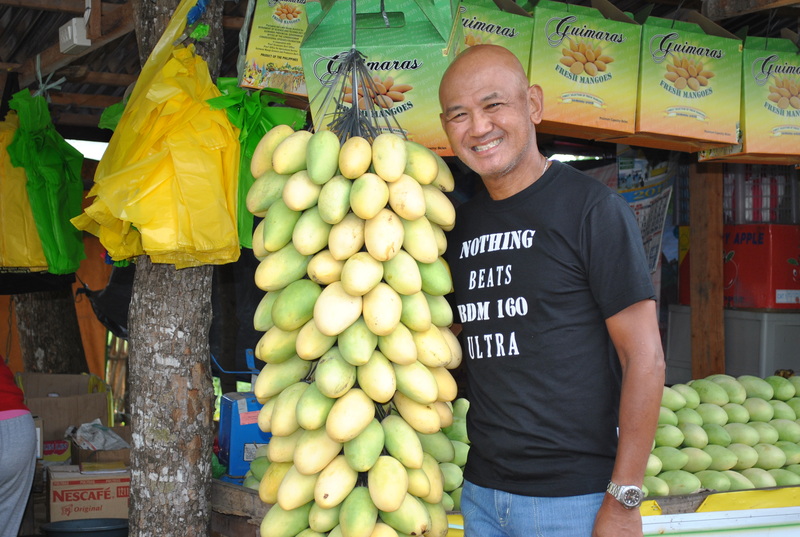 While we were having breakfast, I told them about my primary purpose for the visit—to soak my body in the hot spring water of the famous Mambukal Spring Resort which happens to be one kilometer away from the Headquarters. My secondary purpose for the visit is to request to the two senior officers for the road measurement of the route from San Carlos City to Bacolod City passing through the Don Salvador Benedicto Town. The two officers knew already what was in my mind when I asked them about the distance between these two cities. 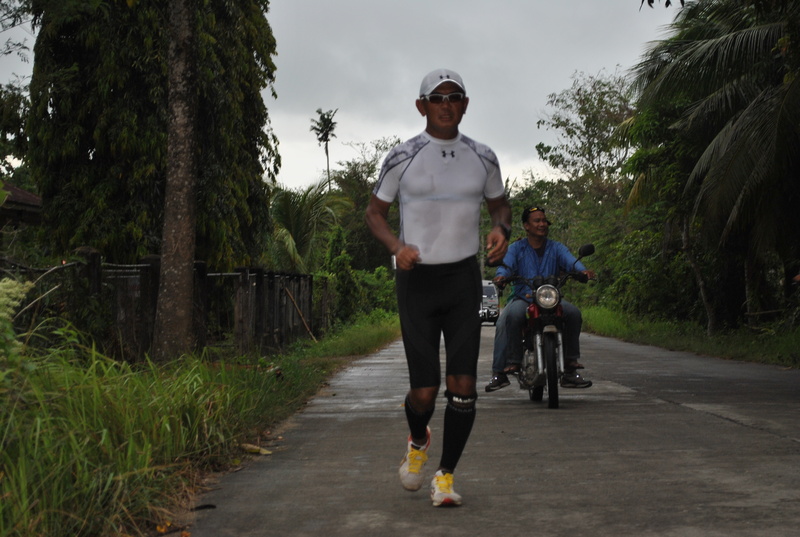 I told them that I missed doing these two things while I was the Division Commander in the area before I retired from the active military service—soaking my body at the Mambukal Resort & running an ultra distance in the area. Anyway, I had 4 hours at the Mambukal (Mild) Hot Spring Pond and I enjoyed the water and the place. I had company of Balikbayans from Canada; foreigners from the Middle East; and from Southeast Asia. 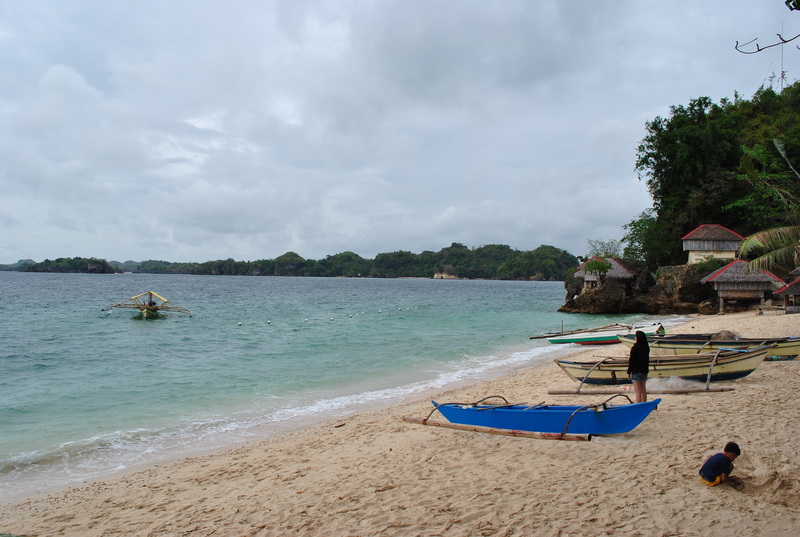 This place is very popular to the locals as well as from foreigners visiting Negros Island. After 4 hours, I dropped by at the Headquarters of the Brigade and I was back in Bacolod City for my Super Ferry trip back to Iloilo City to catch up my flight back to Manila. I was completely relaxed as a result of my hot spring experience that I was able to sleep during the ferry trip. In a few hours later, I was back in Manila. A day after, I received a message from Colonel Aying telling me of the exact distance from San Carlos City to Bacolod City’s Provincial Capitol—it’s 87 Kilometers! I told him that I was asking for the distance up to the Old Bacolod Airport only which he replied that the distance would be shorter by 5-6 kilometers. And I said, it would be fine for me. I thought, 5-6 kilometers is just a “cool down” distance for an ultra runner. I was surprised with the immediate feedback. 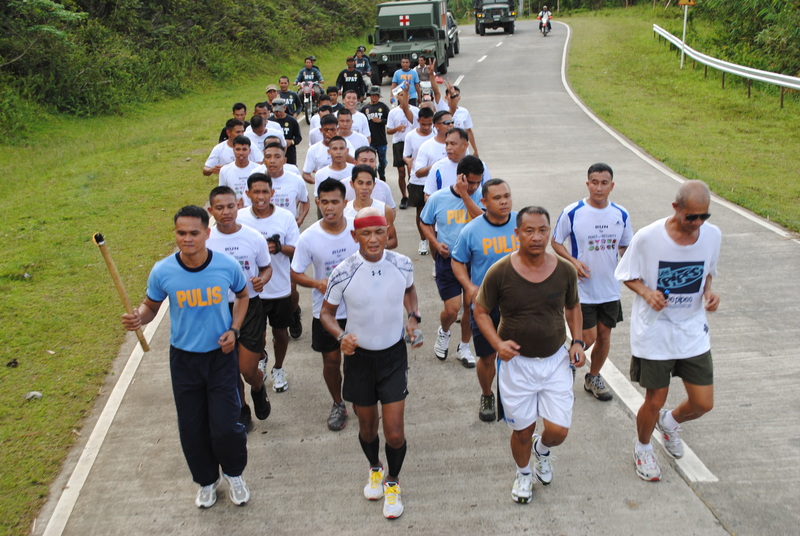 After a week, I received a call and message from Colonel Lactao that he is officially inviting me to conduct a recon run and lead a group of runners from San Carlos City to Bacolod City as a part of a program to observe the Month For International Peace in the month of September and specifically stated that the event will be held on the 21st of September, in time for the 40th celebration of the Declaration of Martial Law. I immediately approved and accepted his invitation as he offered his outmost support for my accommodation and needs for the ultra run. 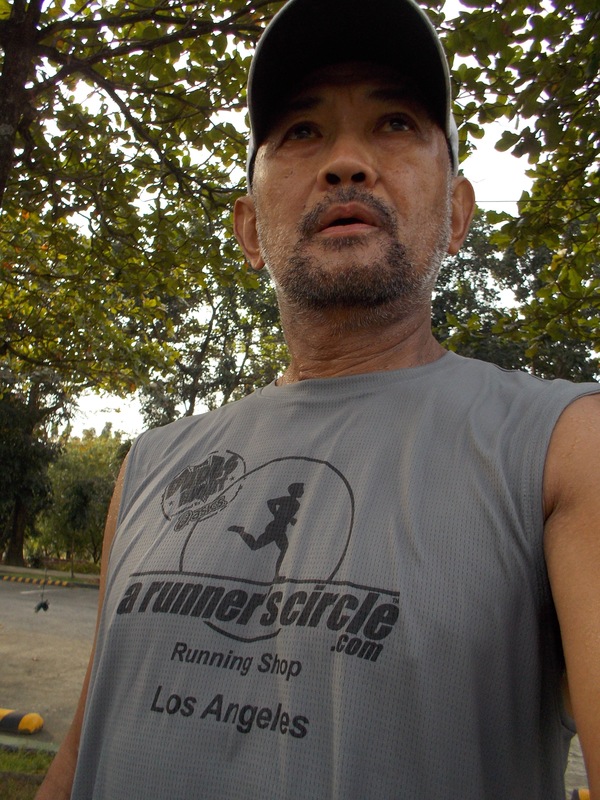 I immediately bought my round trip to Bacolod City the day after I received the invitation and started my training and preparation for the said run. I spent a lot of hours of swimming drills at the Philippine Army Swimming Pool reaching up to 2.5 hours and then another 1-2 hours of running at the Philippine Army Grandstand/Parade Ground Jogging Lane under the heat of the sun. I usually start my swimming drills at 9:00 AM and then go to running at 11:30 AM up to 1:30 PM. I did this routine for almost 3 weeks! 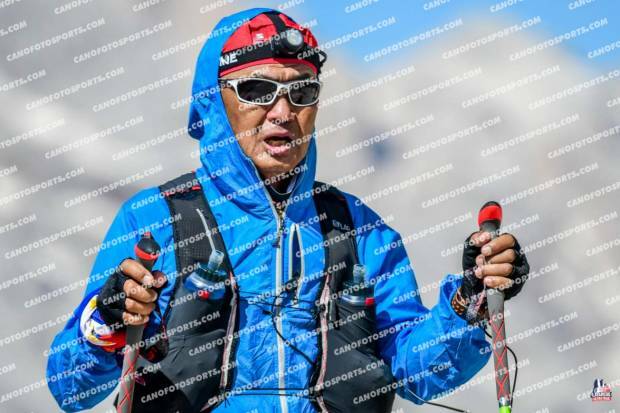 I focused on my endurance to last for the distance of 87 kilometers and then hill workouts during weekends in my peak bagging activities. I knew I did not need so much speed on this run as I would be running with a group of pacers in a formation. This is the reason that you could see my legs to be almost black in color in my pictures for the actual run. 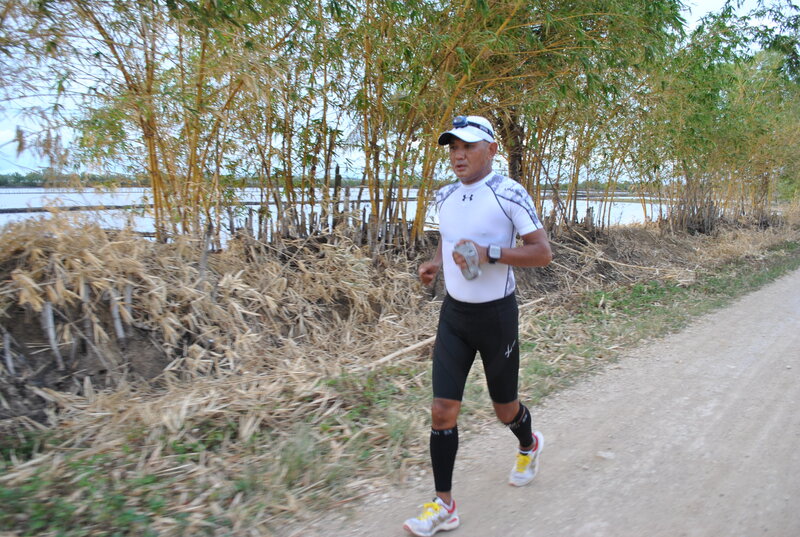 A lot of my running friends had observed that I am “burned” as seen from the color of my skin and had reduced to almost 136 pounds during the Guimaras PAU National Championship. 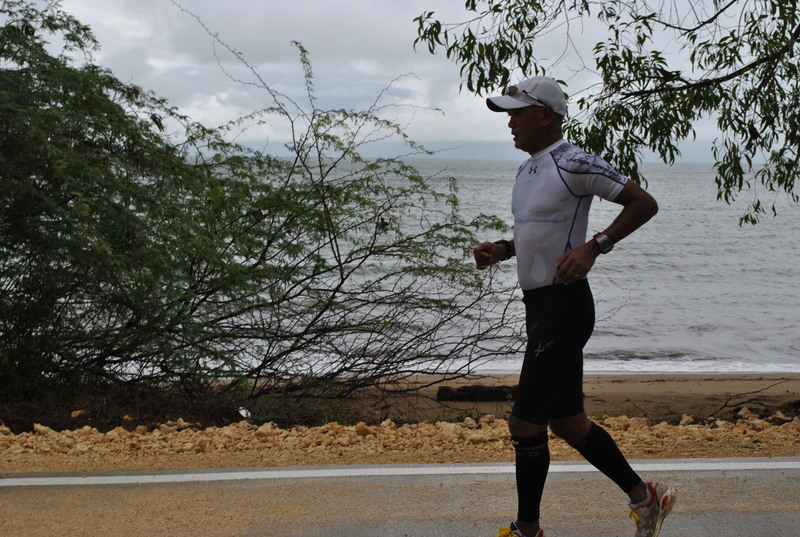 But I did not mention anything about this run as I knew nobody would dare to spend a Friday with me running an 87 Kilometers in a very challenging terrain that crosses the Island of Negros from East to West. There will come a day that my ultra runners will have to experience this route in one of my future PAU Races. 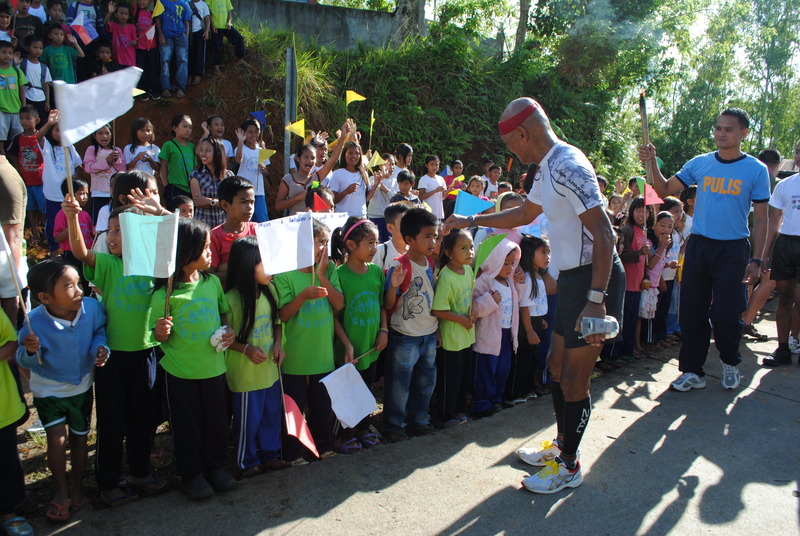 As the days passed and the event getting nearer, I received specific and detailed planning instructions about my run in Negros. I have to finish the event in about 16 hours as depicted in a graph prepared by Colonels Lactao and Aying. 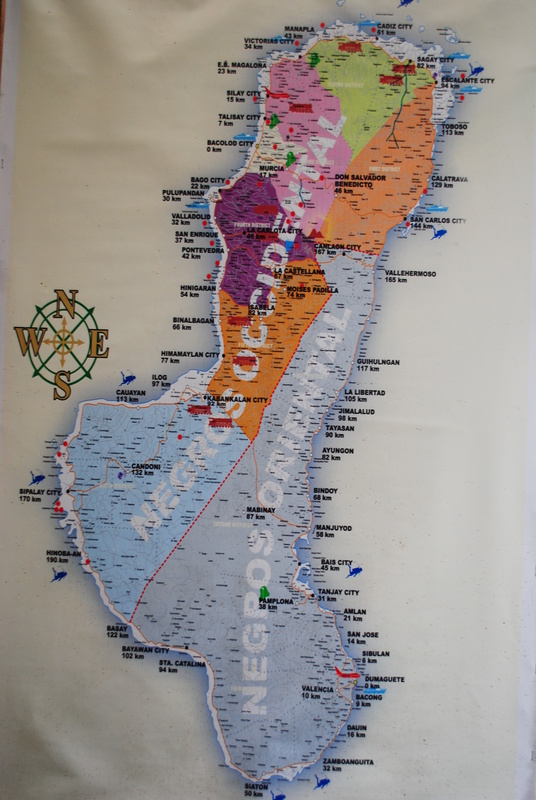 It appears that this is a simultaneous run of THREE GROUPS; one group is coming from the North of Negros; one group is coming from the South; and one group (my group) is coming from the East and our group has the longest distance to run. 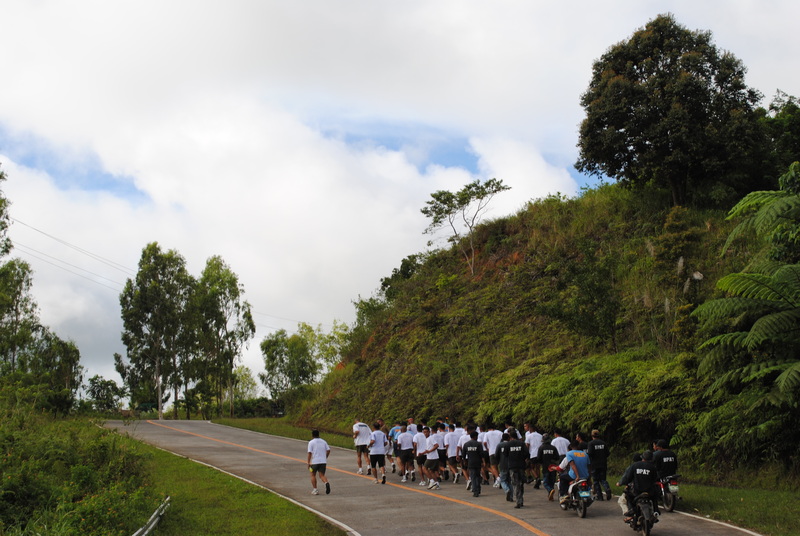 The rest of the groups had to run 12-16 kilometers from a certain point and my group has the longest distance to run! As planned, all the groups would converge to the Pond/Capitol Grounds at exactly the same time (6:00 PM on D-Day) to offer a Torch of Peace to the Provincial Governor & Leaders of Peace Groups in the Area from each of the running groups. These 3 torches carried by each group will be made to light a Big Torch as a Symbol of Peace and Unity for the Island of Negros. What makes the event more meaningful is the reception of the schools and school children; the populace; and the local government units where the run would pass. Each of these institutions along the way had to commit themselves for peace in short program/ceremony in a brief stop in front of the municipal hall of every town that we passed. 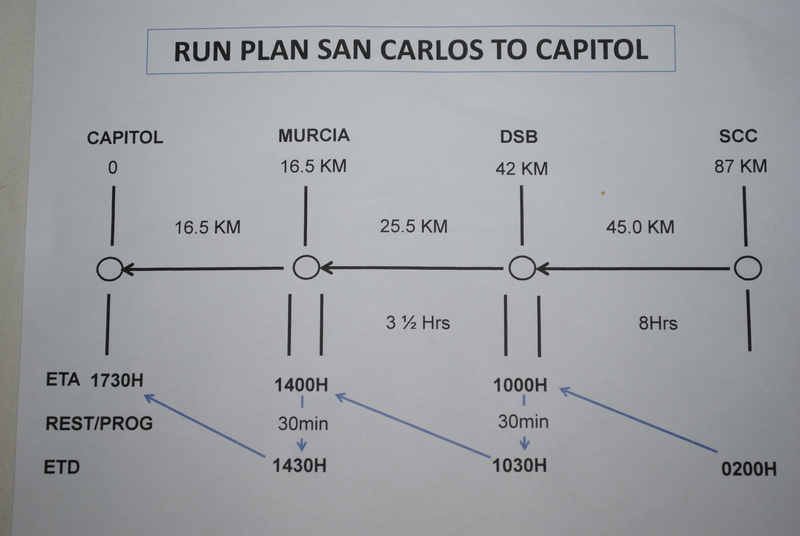 Since my group will be running the farthest distance, the plan was to proceed to San Carlos City a day before D-Day and be able to start the run at exactly 2:00 AM on D-Day. 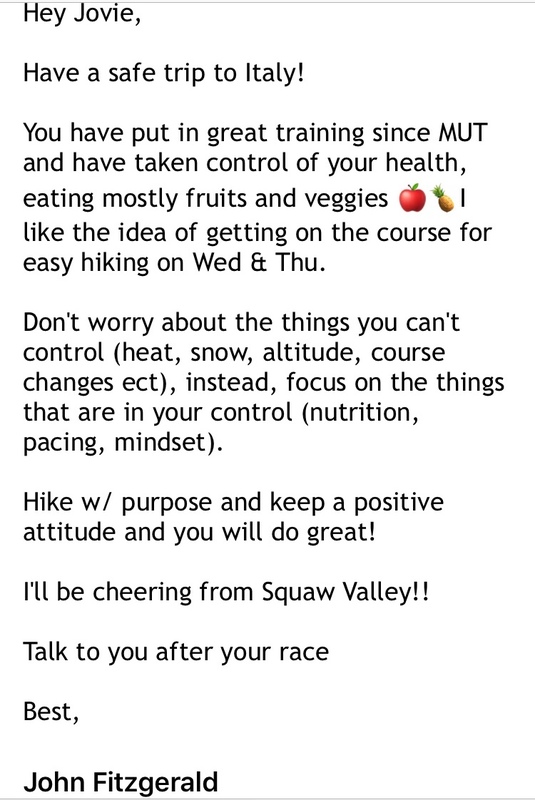 Knowing about the plan of the event, I instructed my host to prepare and make available the hydration and nutrition that I will be needing during the run—-boiled eggs, boiled bananas, Gatorade, Water and Coca-Cola/Mountain Dew. On my end, I prepared my running kit, equipment, and personal hydration mix and system. Additional nutrition consisting of Chocolate Bites (Cloud 9) and Butterscotch from Biscocho Haus will have to be personally procured at SM Bacolod City. I prepared ASICS Gel-Tarther Racing Flats as my shoes; Drymax Socks; Salomon Running Shorts; Under Armour Compression Shirts (One Short Sleeve/White and One Long Sleeve/Red); Oakley Sunglass; Black Diamond Spot Headlight; 2XU Compression Calf Sleeves; “Sprint” Nathan Handheld Bottle; and ASICS Runner’s Cap. As for my electrolyte needs, I prepared 4 packs of my Succeed Amino Acid to be mixed with water. 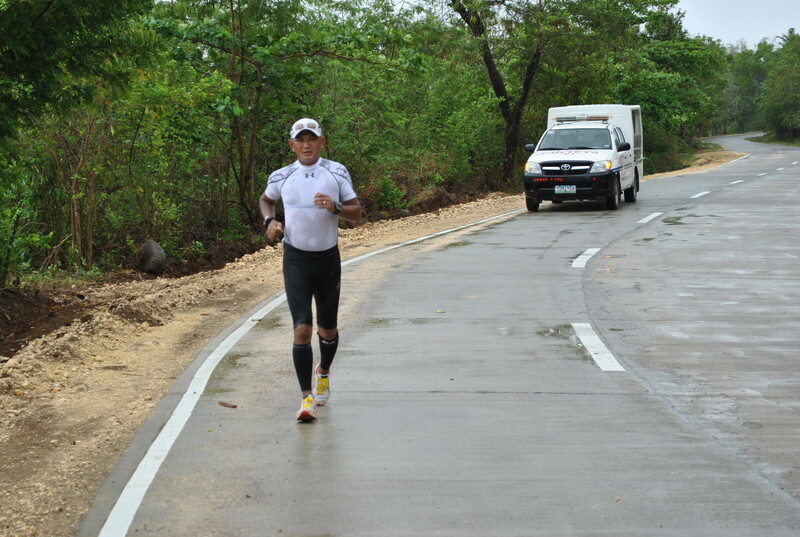 After the Guimaras 110K PAU Nationals, for one week more to go, my preparations and strategy had been implemented and perfected. I made sure that I had enough sleep on every day of this last week prior to the event. Sometimes, my night sleep would average to 8-9 hours! I also did some “core exercises” and leg strengthening exercises at least twice a week. 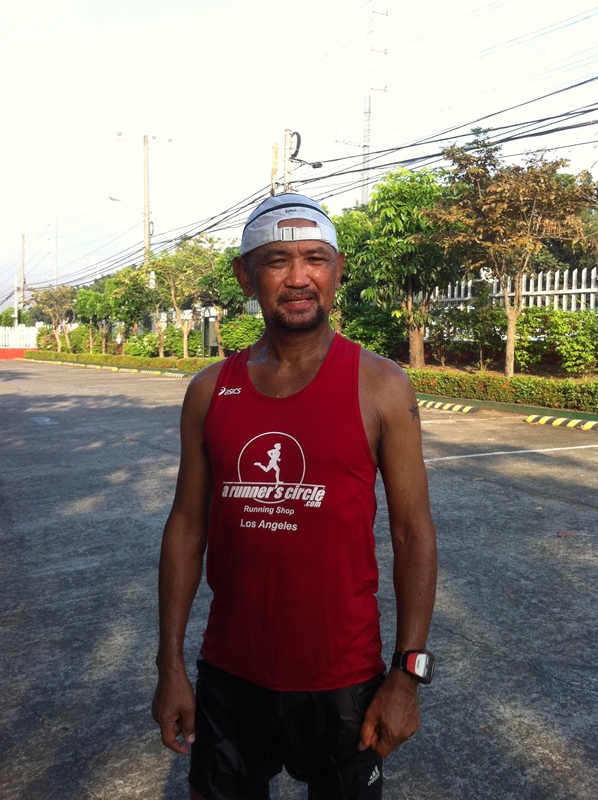 I knew my left knee pain will hold and would not bother me during the run, especially on the downhill part of the run, from Don Benedicto Salvador to Murcia. I was prepared to finish the run! Fast Forward. I arrived in Bacolod City on the early morning of the 20th September, Thursday and I had a breakfast with Colonels Lactao and Aying in their Advance Post Headquarters in Bacolod City. Final Briefing was conducted after the breakfast and everything was ready. I asked my hosts that I need another 3-4 hours of body soaking at the Mambukal Hot Springs before lunch and finally for our trip to San Carlos City. It was granted and I enjoyed every minute of relaxation in the said hot spring pool. At exactly 2:00 PM, we departed the Brigade Headquarters for San Carlos City. Before we reached Don Salvador Benedicto, I was already sleeping. 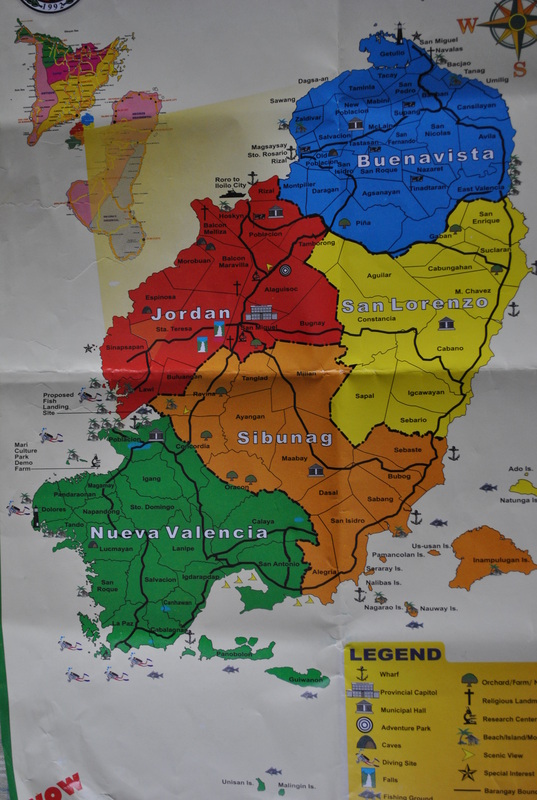 I was glad I did not see the detailed description of the route I was about to climb from San Carlos City to the town of Don Salvador Benedicto (but I knew it already as I passed on this route when I visited this place while I was in the active military service). 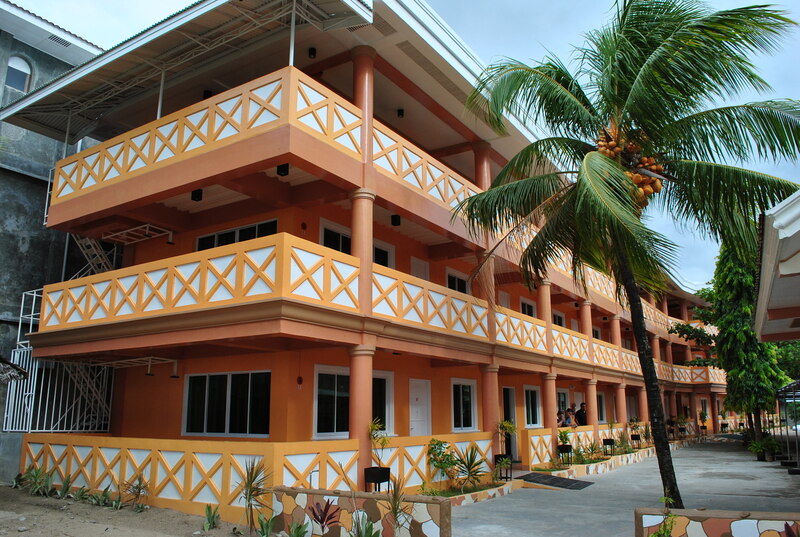 At 4:00 PM, we were already at the Hotel/Pension House/Inn where I would rest and sleep before the start of the run. We were invited by one of the City Board Members (Board Member Renato Bustillo) for dinner and a tour of the city before we went back to the hotel at 9:00 PM. Wake up time was set at 1:00 AM and departure from the hotel was at 1:45 AM. The scheduled time for us had been strictly followed! At 1:50 AM, I was in front of the Catholic Seminary where a group of soldiers, CAFGU, police, and volunteers were waiting for me. 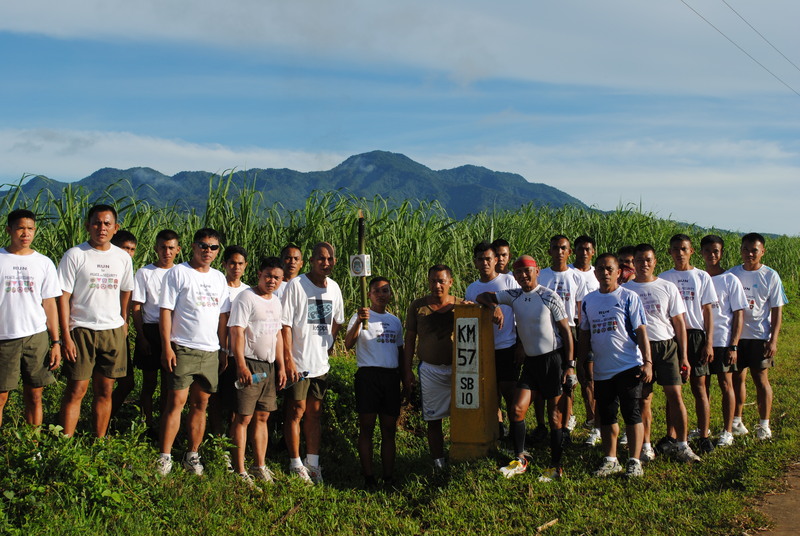 The group of soldiers and police who would be running with me in a group were divided into 3 groups. These three groups would conduct a relay run in every 5 kilometers which means that after a group would run for 5 kilometers, they would be replaced by another group who would run with me for another 5 kilometers, and the 3rd group would replace the 2nd group after 5 kilometers. This rotation of runners would be done repeatedly until about 2 kilometers from each town where the whole 3 groups would be running behind me. And I was running the whole distance without any replacement! So, in every 5 kilometers, I have to replenish and refill my hydration bottle and grab one egg or one boiled banana, while walking, to feed myself. This was done religiously throughout the course of the event. We had to brisk walk on steep inclines and later resume our run on plain and downhill roads. But what made this more enjoyable and refreshing was the continuous “chanting” of the soldiers while running. Oh, I missed this part of running! I could run forever if there is somebody leading a chant where I could follow the chant. This is one of the secrets of running, you should be able to chant on your own to bring out your hidden strength in you. If you are not a soldier or never had an experience in military training, you will not appreciate what it takes to run with a military chant. The run started at exactly 2:00 PM in front of the Catholic Seminary where the 1st group of soldiers, police and volunteers were behind me after we had a simple prayer led by one of the officers of the Brigade. The group has formed as a platoon with a 3-man frontage where I was positioned at the middle. On my right was a soldier who was holding a flaming torch which is the symbol of peace being carried throughout the run and whole distance of the route. I was the one who was controlling the pace. The next group who would relieve the group who were running with me would ride in an Army truck to “leap-frog” to the next 5 kilometers and wait for the running group. The third group would be aboard in an Army truck which was positioned at the back of the running group. The soldiers, police and volunteers who would run with me had a chance to drink their water and eat their food once they are aboard the truck that would carry them to the next 5 kilometers. 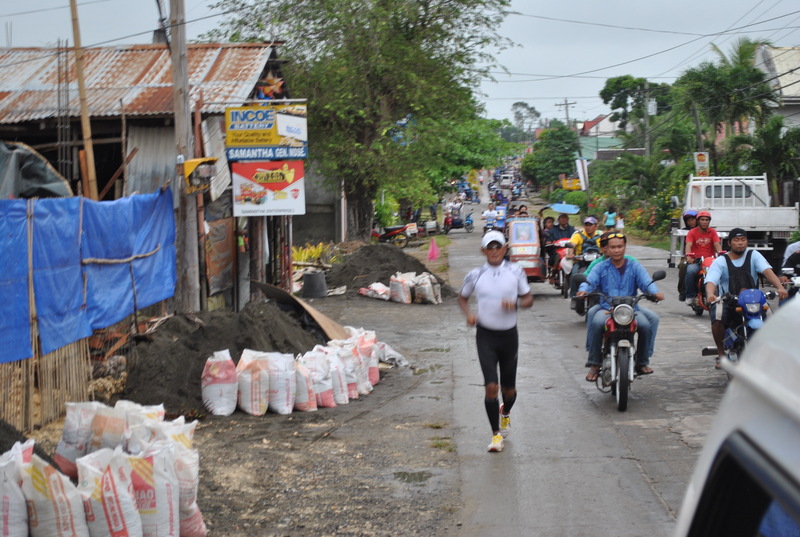 However, once we reach the last 2 kilometers before the Poblacion of a certain municipality. 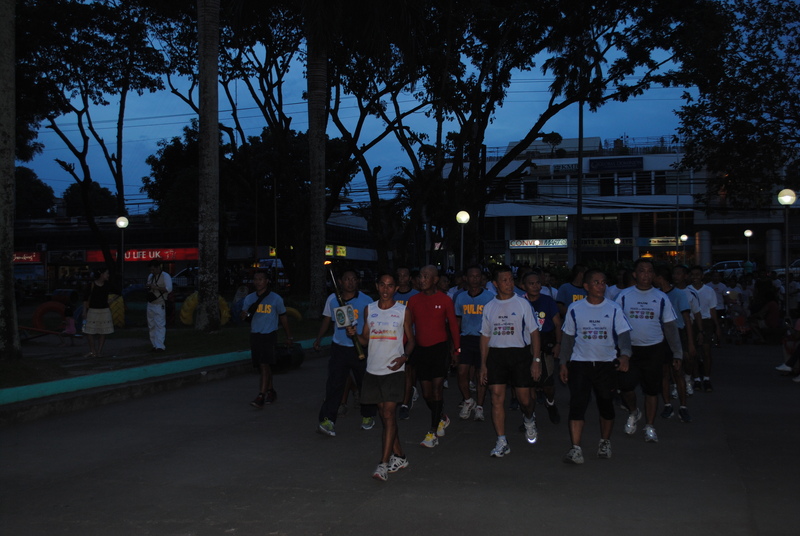 The 3 groups of runners would join me until we finish the run to the Municipal Hall or Municipal Hall’s Plaza. With our fans during the run! 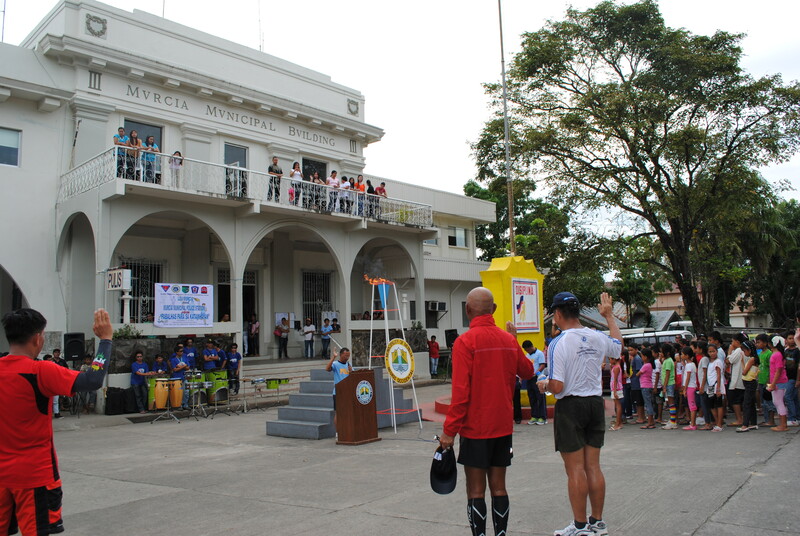 As we reached the Municipal Hall, the Municipal Mayor and his staff would run with us for almost 1 kilometer and stop for a simple program/ceremony. The Municipal Mayor would talk about bringing peace and unity for the municipality and for the whole province. The program usually takes about 30 minutes. In Don Salvador Benedicto, we were received by the Municipal Mayor, Vice-Mayor, and some of its Councilors and some speeches were made. The same program was made in the Municipality of Murcia with the presence of the Municipal Mayor, Vice-Mayor and its Councilors. What was so touching to see was the overwhelming support of the people along the way who would greet us and to wave us. What was most touching and memorable was the presence of school children lined up along the street/highway fronting the school with their flaglets raised and waving to us, shouting “PEACE” on top of their voices! It would had been more memorable if the “enemies” of the government and the Armed Force/Police were running with us! How I wished they were there along the highway observing what was happening and could have seen the reaction of the local people and the children. The teachers were out also from their classrooms with their school children waving their hands and shouting “PEACE”. They even had a picture pose taken with me and the group of runners. A schedule or time plan was made for my run. My group and I had to reach the Provincial Capitol, the finish line for the run, in 16.5 hours from the time we started the run. 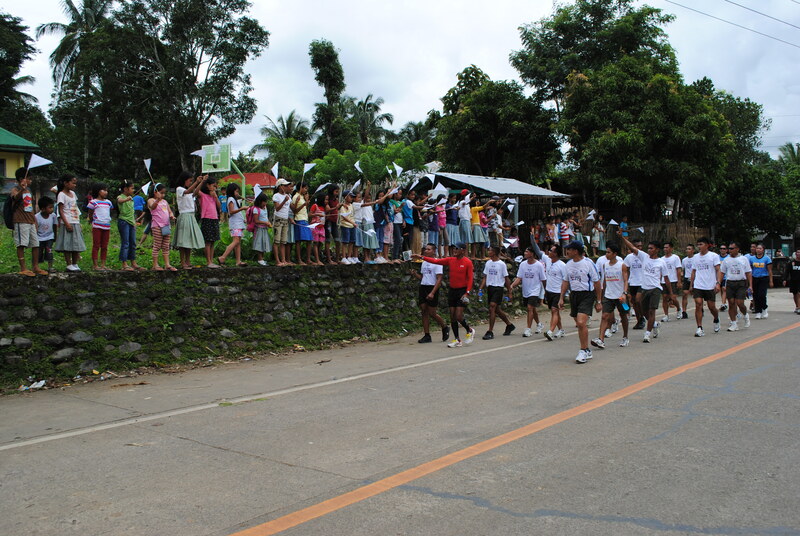 This is to include the ceremonies/programs that we made in every municipality and those brief rests that we had in changing the running groups. We arrived in Don Salvador Benedicto one hour ahead of schedule but we did not waste any time to spend this buffer time to rest some more. Even if the course was already downhill towards the Municipality of Murcia, we still managed to maintain our running pace where the group was intact. After the Program & Ceremony at the Municipality Plaza of Murcia, we still have 30 minutes as our buffer time for our time plan. However, we still maintained our jogging and chanting. 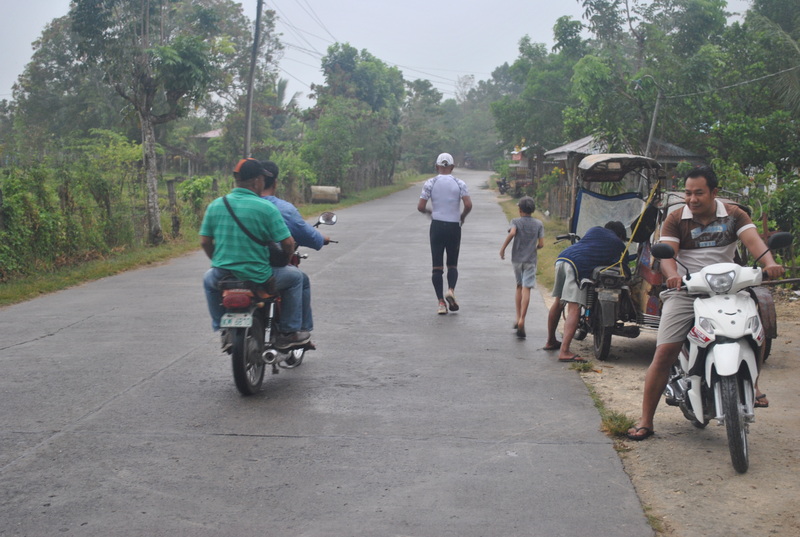 On the last 5 Kilometers as we entered the Poblacion of Bacolod City, we re-formed our group and allowed the three groups to run with me until we reached the Provincial Capitol. It appeared that our group was ahead of schedule than the two groups who started their respective runs from the South and from the North. Our group had to wait for about 20-30 minutes from a block away from the supposed meeting place in order to monitor the coming of the other two running groups. Finally, three groups entered the big compound/Pond Area of the Provincial Capitol with my group entering from the East; one group entering the North Gate; and the last group entering the South Gate. I had the privilege to give the symbolic torch of peace which our running group carried to the Provincial Governor. 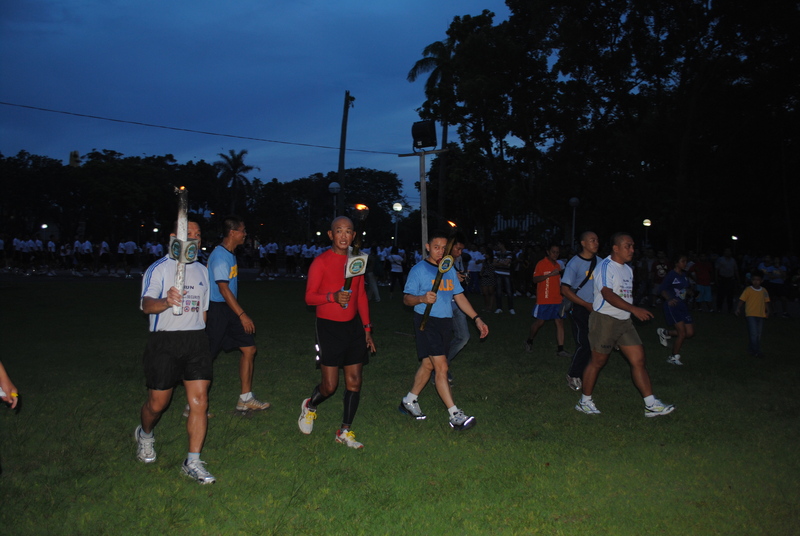 The rest of the torches were given by the PNP Provincial Director and the Head of Peace Advocacy Group in the province to the rest of the VIPs in the ceremony. 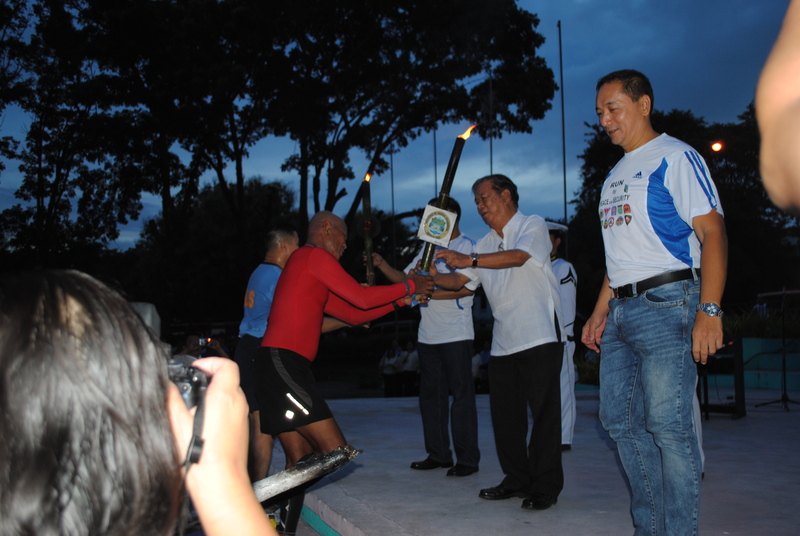 The rite culminated with the three torches (held by the Provincial Governor and the VIPs) lighting a big torch at the center of the stage symbolizing peace and unity for the whole province of Negros Occidental. The rites were followed by a program where all the stakeholders of peace and unity for the whole province had a chance to deliver their respective message. 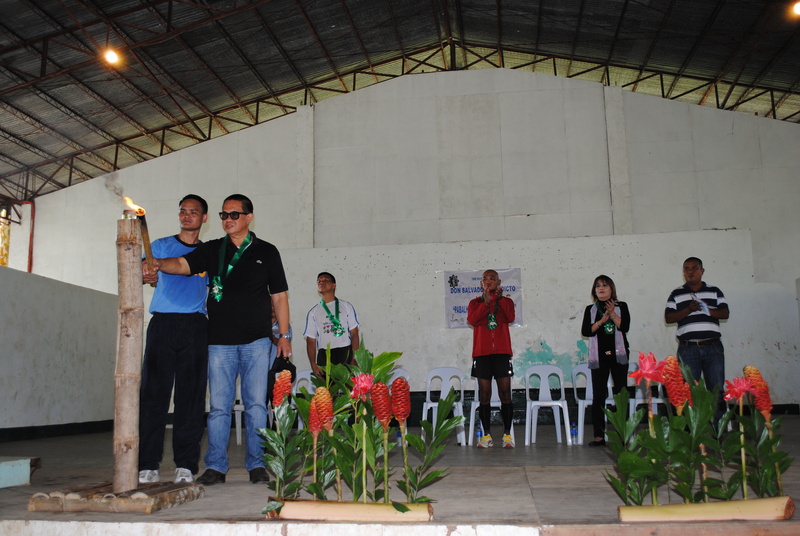 Provincial Governor of Negros Occidental Receiving My Group’s Symbolic Torch of Peace & Unity. Mission Accomplished! As for me, as soon as I was able to hand in my group’s torch, I was out of the Provincial Capitol Grounds and on my way to the Mambukal Hot Spring for Dinner; a Cold Bath and Hot Body Soaking in the Hot Spring Pond, in that order. The Body Soaking for 2 hours after dinner was heavenly! 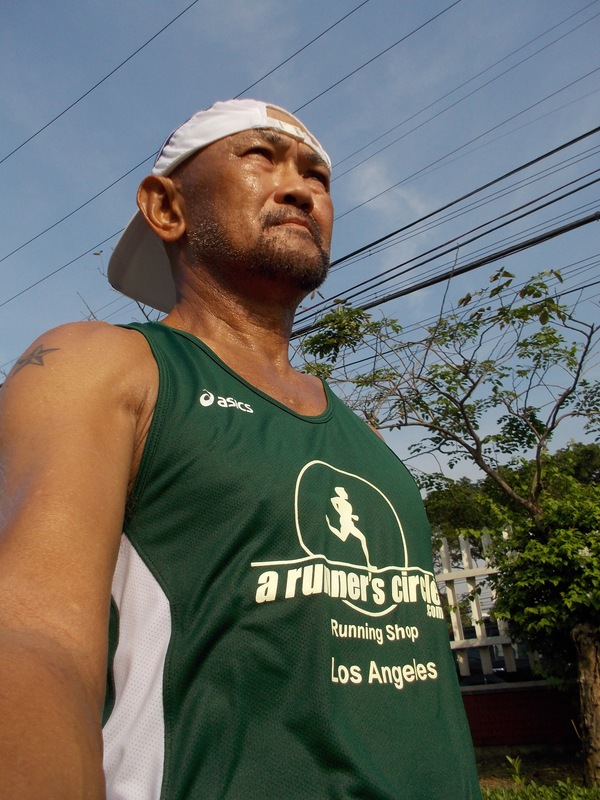 I did not realize the gravity and importance of what I’ve done for the 87-Kilometer Run For Peace in Negros Occidental not until I was back in Manila about to have my night sleep, a day after the run! I received a lot of feedback from text messages and calls wherein I was the “talk of the town”, so to speak, from the Provincial Governor, the VIPs, the Municipal Mayors and their Staffs, Officers and Men of the Philippine Army Brigade and the Philippine National Police down to the people of the Municipalities we have passed, about the feat that a 60-year old retired Major General of the AFP and a Senior Citizen at that, for having been able to run the said distance of 87 kilometers, from Don Salvador Benedicto to Bacolod City, for 16 ½ hours. The only words that I could say to reply to these feedbacks was, “Thank You”. It was a good ride, an experience of a lifetime, and a wonderful journey with the men in uniform and peace in the Province of Negros Occidental. My special thanks go to Colonel Oscar Lactao, Brigade Commander of the 303rd Infantry Brigade of the Philippine Army, Colonel John Aying, and to the rest of their staff. These guys were the organizers of this event and they did a very splendid job. My salute and congratulations to you for an amazing success of the event! May peace and unity come to every province in the whole country! To the people of Negros Occidental, I will be back!